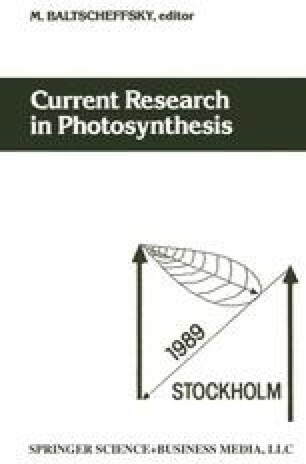 With increasing incident light the efficiency of photosynthesis (Φs = rate of photosynthetic O2 evolution/incident light intensity) tends to decrease. As processes beyond photosystem 2 (PS2) become rate limiting, QA becomes progressively reduced, such that PS2 centres are no longer able to carry out charge separation (closed centres). This is observed as a decrease in the coefficient of fluorescence quenching by photochemistry, qQ, which indicates the proportion of excitation energy delivered to PS2 centres that is captured by ‘open’ centres. Unless a limitation develops at PS2 itself Φs should decrease in proportion to qQ. However it has been found that this is not the case in vivo, and that the parameter Φp (= Φs/qQ), considered to reflect intrinsic quantum yield of PS2, decreases with increasing incident light [1,2]. It has been suggested that this decrease in Φp is related to the non-photochemical dissipation of excitation observed as fluorescence quenching (qNP) [1,2]. In this paper we describe work carried out to determine the mechanism of Φp changes by studying in vitro systems. Although we observe changes in Φp directly related to qNP, we also confirm the observation of Oxborough and Horton  that Φp changes can be observed independently of qNP.